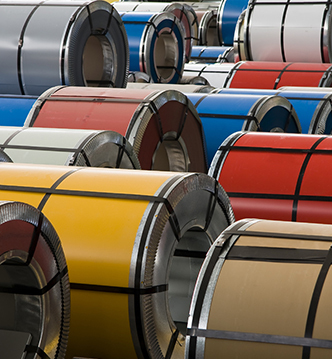 Kandil Pre-Painted steel products are used in all sectors of industry. In building and construction, profiles are used for wall cladding and roofing, and also for applications such as suspended ceilings, lighting etc. In general industry, these products have a variety of applications, including metal furniture, HVAC (Heating, Ventilating, Air Conditioning) and many others. Brown goods (casings for Hi-Fi, VCR, DVD, electronic and computer equipment) are another successful field of application for Pre-Painted steel products. This variety of uses is a result of three key material properties – strength, good formability and flexible surface design. Kandil pre-painted steel products are multi-talented materials that meet end-user requirements and needs. We design the surface properties and colors to come across very specific technical and aesthetic requirements. It is served with various paints that are applied to a metallic substrate as a part of a continuous process, which ensures optimum adhesion of the coating and improved corrosion resistance of the underlying steel substrate. In pre-painted steel, the substrate is usually galvanized steel. The choice of the paint system depends on the environmental conditions to which the product will be exposed and the technical properties required. Kandil pre-painted steel products are available in a rich diversity of colors (a variety of color options are available) and surface appearances. Nevertheless, each product has its own specific properties and applications. The appropriate choice is therefore crucial and should be made in close collaboration with Kandil technical and sales teams.